Source code (in BASIC) included. FakeFiles is designed to create fake PGP encrypted files for the purposes of 'plausible deniability' if faced with encrypted files being found on your hard drive and refusing to hand over the encryption keys. 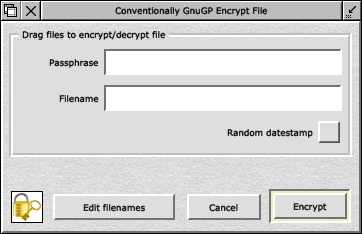 FakeFiles will create any number of genuine looking PGP encrypted files on your hard disc. However, they're totally random, cannot be decrypted and of course you don't have the key - because the computer automatically destroyed it without telling you in the first place. FakeFiles was inspired by this story which describes how, "in the event that there was doubt that a suspect did not possess a key, he said, it was up to the prosecution to demonstrate beyond a reasonable doubt that they could know the passphrase." Because there is no way of telling the difference between randomly encrypted files for which you don't have the passphrase, and thus can't provide it on demand, and those files genuinely encrypted there is no evidence of which are dummies and which are real. Thus, a user could adopt the strategy of encrypting any genuine files using passphrase (or seed file) A for files he/she is willing to decrypt under duress, whilst reserving a different (very strong) passphrase B for more important files that must never be revealed. With a selection of randomly created files that the user doesn't have the passphrase for, there is no way of distinguishing which files are random and which have been genuinely encrypted using passphrase A or B.
Additionally FakeFiles is capable of genuinely encrypting real files using any passphrase, and decrypting them again if provided with the same passphrase or 'seed' file (which could be a mutually known file from anywhere on the internet). If the wrong passphrase is given, the file is irretrievably deleted - and there is no way of knowing whether a passphrase is genuine or not, without trying it - and you only get one go! I say, "Death to RIP!". Users of FakeFiles may also be interested in my other Crypto and privacy software. 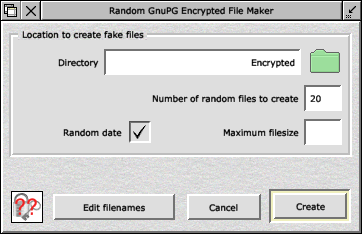 The default 'fake files' window, allowing you to create a number of fake GnuPG encrypted files in a given directory. The 'genuine' encryption mode, where you can specify a passphrase or 'seed file' and the file you wish to actually encrypt. There is no way of identifying which files have been genuinely encrypted and which ones are random - for which you don't know, and have never known, the passphrase. What's more, you only get one chance to decrypt with the correct passphrase, otherwise the file is irretrievably deleted and the relevant disc space 'nuked'. Generates sprite files having exactly the same format and visual appearance as those created by !Stego, but without any hidden message. It also generates random PGP messages which nobody can decrypt, enabling you to prove that you cannot decrypt all your PGP files. This may be useful to thwart any attempts to make you reveal the contents of encrypted files. enables you to store a number of encrypted directories inside a container file, each with its own unique passphrase. The program is designed so that no one without a knowledge of the passphrases can determine how many encrypted directories actually exist. A particular directory can be decrypted only by entering the correct passphrase. If any authorities ever demand access to your encrypted data, you can safely reveal one or more of your less important hidden directories, while denying that any others exist without fear that they can ever be detected. a) Made 'Random datestamp' ON by default. b) Added some hints and tips to the documentation. typo in the loop prevented the file being overwritten. b) Added additional pass to nuking file, using data from !FakeFiles manual. d) Added 'Random datestamp' option to random files. e) Narrowed random datestamp period down a bit. a) Added support for GnuPG so that messages are genuinely encrypted. encryption as the random files. d) Added Help option to main menu - to load manual. e) Added website button to 'Info' window, to check for updates.